One of the wonderful things about Great Britain is that even its historical places have history. John Dryden, England’s first Poet Laureate is connected with the family who originally built Cannons Ashby although he never lived there himself, spending most of his life in London. 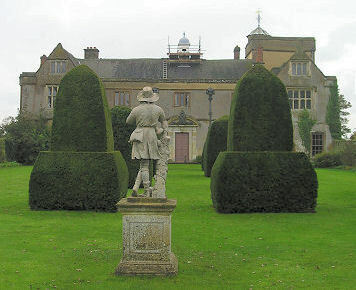 Canons Ashby is an Elizabethan manor house as you approach the house and gardens you pass St Mary’s church which is the last remaining building of the abbey complex which gave the house its name, but on to the gardens. 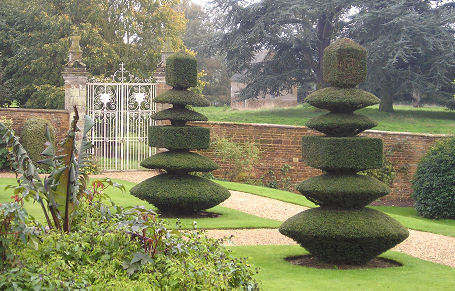 Formal gardens undoubtedly surrounded the Sixteenth Century house as that was the current style but all traces of them disappeared long ago. 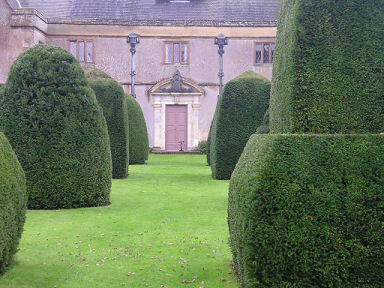 The current garden plan is largely the work of Edward Dryden who laid down the paths, walls and terraces between 1708 and 1718 in the style of royal gardeners such as George London and Henry Wise. The gate piers were decorated in an antiquarian fashion including the globe and lion crest of the Drydens. Fortunately for us the conservative minded Drydens continued with the design in the late eighteenth century when many other houses were having their gardens ripped up and planted in the landscape style of Lancelot “Capability” Brown. 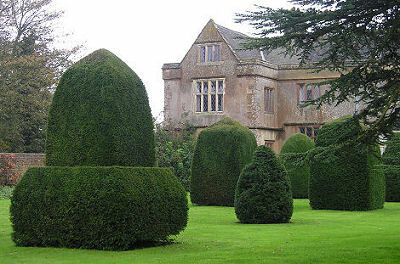 In the late nineteenth Century when Alice Dryden photographed the garden it was largely mature and what we see today. 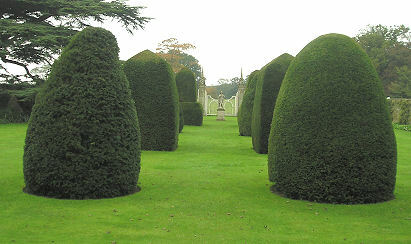 At this time the local barber was the topiarist which somehow seems fitting. 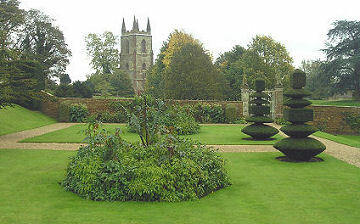 The rarity of the garden was being realised by this time and Sir Henry Dryden opened the garden to the public and provided a plan for a history of gardening produced at the time. By 1904 the garden was to have a major influence on the Arts and Crafts style of people such as Sir Edwin Lutyens and Gertrude Jekyll. Although the garden was looked after during the 1920’s and 30’s it began to become overgrown later, especially during the war years. Many of the large trees were attacked by gales or dutch elm disease in the middle of the twentieth century and when the National Trust took over in 1981 they faced a huge task of pruning and restoring the garden to the earlier plan. At the beginning of the twenty first century all that glory is revealed once more. What a walk up to your front door!